Anthonij Rupert Wyne: Terra del Capo Pinot Grigio �The Anthonij Rupert Terra del Capo Pinot Grigio:Subtle whiffs of lemon and orange leaf, peach and stone fruit tempt the nose. 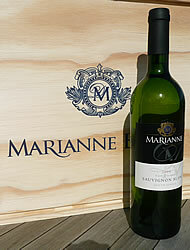 The palate offers tangy and succulent notes of peach and nectarine fruit, along with some lemon freshness. Rounded yet juicy and refershing with a delightful jujube tail. https://www.weinbaule.de/white-wine-south-africa-terra-del-capo-pinot-grigio-p-2485.html?osCsid=94b2750730d658742d7cd6d59b53069e"> Wine 8.98 6009641410913 WeinBaule.de | The Home of Wine Anthonij Rupert Wyne New In stock!